← How crowded is your neighborhood today? I took this photo as we were flying over the Swedish coast on our way to Stockholm. I loved the clouds. 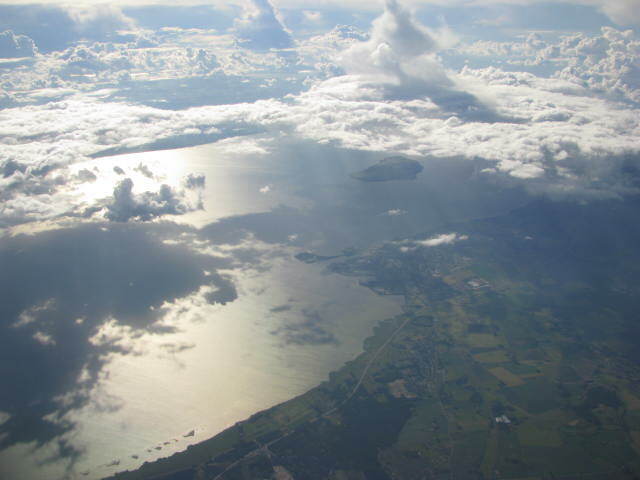 This entry was posted in Travel Photos and tagged 50 Year Project, Clouds, Europe, Flying, Life, Nature, Photography, Stockholm, Sweden, Sweden's coastline, Travel, Travel Blog, Travel Journal. Bookmark the permalink. We had the best weather in Stockholm. Many of the places we visited had a lot of rain. Hi Emily. Thanks for the encouragement. So far I’ve been enjoying the project. It does keep me busy and focused on the positive in life. Nice meeting you! Many of our flights had wonderful cloud formations. It was cool to see them and to almost touch them. Oh cool! I’ll be in Stockholm next week, would love to hear some go-sees from you. Enjoy your time there! I loved Stockholm. The islands are so beautiful. I enjoyed seeing the medieval city on Gamla Stan–it does get crowded with tourists. And Djurgarden is a great place to wander around and hike. So so cool 🙂 Love this shot. Makes me want to get on a plane and fly ANYWHERE! I feel that way all of the time. I live near Heathrow and hear the planes every minute or so and I always wonder where they are going. This view of the clouds and the land beneath is beautiful. I do to…and I love when you can see the wing chop through the clouds. Wow. Other than that, I’m speechless! beautiful clouds, i appreciate how difficult it is to take photos through the little plane window, and how the light is often against you, so well done!!! I haven’t been to the Netherlands. I hope you enjoy and I look forward to seeing your photos. I can certainly see why you love the clouds…. They have a special quality to them. Beautiful! The clouds take on a different personality when you are that high up in the air!